The all-new 2019 Chevrolet Blazer is a new take on an old classic, treating modern drivers to rugged capabilities in a comfy package. You've heard of the Chevy Blazer. Variations on this model-including the infamous two-door SUV with the removable top-date back to the 1960s. If you scour the used market, you might even find a recent compact SUV rendition that was based on the S-10 pickup truck. This Blazer, though, is an all-new model. This Chevy is a compact crossover designed with modern drivers in mind, featuring capable powertrains and cushy, roomy seating. The Blazer's got space for five passengers, and its spacious seating offers major appeal for families who spend a lot of time on the road. Like any good Chevy, the new Blazer is fully stocked with modern tech features, from standard smartphone integration (Apple CarPlay/Android Auto) to a nifty Wi-Fi hotspot. The Blazer also casts a wide safety net, compliments of the standard OnStar telematics system. Should you get into an accident or find yourself broken down on the side of the road, OnStar sends the help you need. As you climb the Blazer trim levels, things get pretty luxurious. You can find leather upholstery, Bose premium sound, and all the chrome trim your little heart desires. When winter is hitting you hard, you can warm your hands on the heated steering wheel and cozy up in the Blazer's heated front seats. But you don't necessarily have to pay extra for upscale style because every Blazer comes standard with a silky smooth ride. 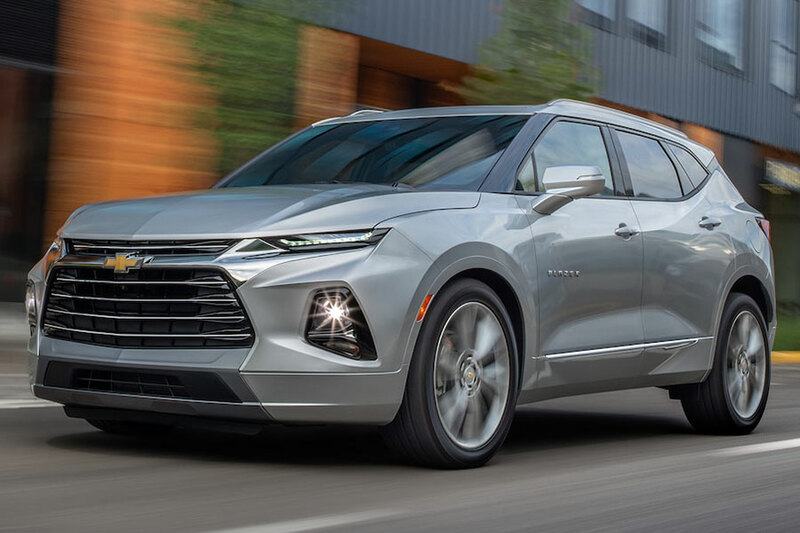 Why choose the 2019 Chevrolet Blazer? When you're in the market for a five-passenger compact crossover with actual capabilities to match its rugged good looks, it's tough to do better than the all-new Blazer. This SUV might fit into the compact class, but you'd never know from the cabin, where seating is incredibly spacious. The solid powertrain lineup is another high point. We're especially big fans of the strong V6 engine, your ally for towing big toys and travelling down rugged trails. What's the 2019 Chevrolet Blazer towing capacity? This all-new Blazer is a capable crossover SUV - the perfect pick for families with boats and other big toys. When you choose the upgraded 3.6-liter V6 engine and all-wheel drive, you can tow max loads of up to 4,500 pounds. A Blazer with the base 2.5-liter four-cylinder engine or front-wheel drive tows max loads of 1,500 pounds. Is the 2019 Chevrolet Blazer AWD? Why, yes. At least, you can add all-wheel-drive performance gear as an option, regardless of Blazer trim or powertrain. If you're the adventurous type, we highly recommend this add-on. The all-wheel-drive system automatically detects slippage and sends power to all four wheels to help you maintain control on sandy or muddy trails. What's the 2019 Chevrolet Blazer mpg? The Blazer is all about premium power and performance. But the Blazer balances its rugged capabilities with reasonable fuel mileage. Depending on how you outfit yours, the Chevy Blazer earns up to 22 city/27 highway mpg.